Ristar (also known as Ristar the Shooting Star) is the 1995 platformer developed by Sonic Team and released for the SEGA Genesis/Mega Drive and later for the SEGA Game Gear. The game follows the titular young star as he travels across the Valdi Galaxy in pursuit of the evil space pirate Kaiser Greedy, who has kidnapped the Legendary Hero that watches over the galaxy and protects it from harm. Although it is often overshadowed by Sonic Team’s other popular series, including Phantasy Star, Samba de Amigo, NiGHTS, and, of course, Sonic the Hedgehog, Ristar has managed to hold its own over a veritable who’s who of video game classics, and today it is often considered to be one of the very best and most beloved games on the platform. Without further ado, let’s blast off and take a look at a cheerful little tune called “Star Humming”. SEGA Rally Championship is the 1994/1995 arcade rally racing classic developed by SEGA-AM5 and later ported by SEGA-AM3 to the Saturn console and eventually several other platforms. Designed by Tetsuya Mizuguchi, whom would go on to later create and be best known for several music-focused titles such as Space Channel 5, REZ and Child of Eden. A different style entirely, SEGA Rally Championship was no different by the importance of it’s music as the soundtrack was assembled to best emulate the frantic and unpredictable nature of the world of rally racing. This time we will we will be listening to the song featured in Desert, the first course of SEGA Rally Championship. Included after the break are several remixes across various platforms. Comix Zone is the 1995 side-scrolling action-beat ’em up classic developed by Sega Technical Institute, an American-based subdivision of Sonic Team best known for their work on several Sonic the Hedgehog games, Kid Chameleon and The Ooze. Consistently praised for their unique and sometimes outlandish sense of style, STI often combined elements of pop culture, including music, film, and television, into their games, creating a melting pot of new and interesting ideas from which to draw upon. Nowhere is this influence more apparent than in Comix Zone, where it becomes almost immediately apparent upon booting the game up that the player is in for a unique experience. Stylistically, Comix Zone borrows heavily from the Seattle grunge movement that was very prevalent at the time of the game’s release, with the main character, Sketch Turner, acting as the embodiment of all things ’90s. A freelance comic book artist, rock musician, and cool dude with attitude, Sketch is working late one stormy night on his latest comic book, the Comix Zone, a post- apocalyptic romp taking place on a war-torn planet Earth following a hostile invasion by aliens and mutants, when suddenly a lightning bolt strikes the book, releasing the comic’s antagonist, the mutant Mortus, into the real world. Mortus then traps Sketch and his beloved pet rat, Roadkill, inside the pages of his own comic book, where he must fight his way through panel after panel to defeat Mortus and escape. After the break, we’ll dive right into this story and enter the Comix Zone. 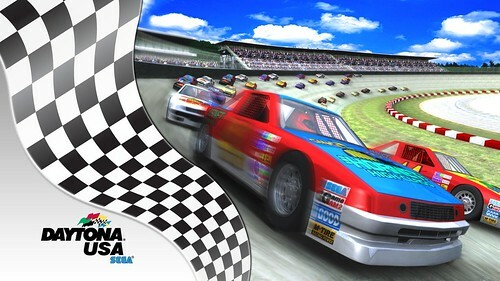 The classic AM2 arcade racing game Daytona USA will be made available for download later today and early tomorrow for the PlayStation Network on PlayStation 3 and Xbox Live Arcade for Xbox 360, respectfully. However, the European PlayStation 3 release has been delayed until “Late November” due to Sony’s policies. The title will be 10 USD, 7 EUR, 6 GBP or 800 Microsoft Points depending on your platform and region. Those who purchase the PlayStation Network release within two weeks of it’s release will receive extra downloadable dashboard themes and avatars to use on your profile. Phantasy Star III: Generations of Doom is the classic 1990 role playing game for the SEGA Genesis/Mega Drive. Considered the ‘Black Sheep’ of the series by many a fan, Generations of Doom differs greatly from previous and future titles in the franchise in it’s supposed medieval-fantasy setting instead of the series’ standard science fiction and also with how the story progresses based on whom the player chooses to marry. This eventually leads to an entirely new cast based on the player’s children and then eventually their childrens’ children. This time we will focus on the song from the introductory sequence. Above is the arranged edition made along with a number of franchise favorites, after the break I have included the original, among many remixes and fan variations. Saito Masato, one of the original members of the S.S.T. Band (short for SEGA Sound Team Band) has formed a new band under the name Blind Spot. This new group will have similar concerts compared to the S.S.T. Band and play various songs from SEGA’s arcade games from the 1980s and 1990s. The new band members will bring some new musical instruments, such as a saxophone. It is not known at this time if they will release an album or have a similar recording history to the S.S.T. Band. Videos of them practicing are available here, and after the break is a list of SEGA songs they plan to play in concerts. Sakura Taisen (also known as Sakura Wars) is the classic 1996 SEGA Saturn role playing game that innovated by focusing on character development and interactions instead of random battle encounters so that the player would care deeper for the cast, or perhaps even love them. You play as Ogami Ichiro, leader of the Imperial Assault Force and are given the mission to end the terror from mysterious enemies based on demon lore in an alternative steam punk version of 1920’s Japan. This time we will focus on the song from the first battle, Persevering. Hit the jump to listen to some of the different variations and related songs. Cyber Troopers: Virtual-On is the 1995 classic SEGA arcade and Saturn game that became notable for it’s ‘Japanese mech’ art style, complex-yet-exhilarating gameplay design, unique control setup, detailed characters and plot. It is also one of the first full 3D home console fighting games to support online play. Today we will focus on “Into The Blue Sky”, the song featured on the first level of the original title. It is also considered the main theme of the Virtualoid Temjin. Hit the jump to listen to a handful of the remixes available, including some by fans. Shining Force II is the classic 1993/1994 strategy role playing game by ‘Sonic! Software Planning’ (now known as Camelot Software Planning) for the SEGA Genesis/Mega Drive. Composed by renowned video game musician Motoaki Takenouchi, the soundtrack with much of the Shining series has been renowned for it’s encouraging and lighthearted take on a sinister, war-torn fantasy world. Shining Force II is no different, with the main overworld theme being considered one of the best in the franchise. Not just a memorable tune, but an impressive use of the Genesis/Mega Drive’s sound system with brilliant use of authentic horn and drum sounds all brought together in a wonderful sweeping adventurous style. Continue after the break to listen to different variations including the rarely heard Game Gear version and an official orchestral release.